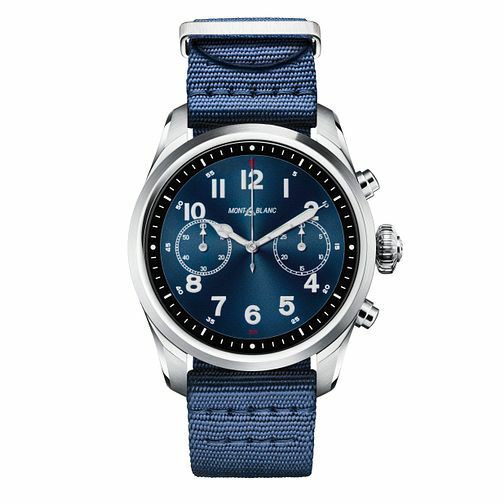 Boasting a 42mm stainless steel case with a 1.2" display, this Summit 2 model by Montblanc is the future of smartwatches. Compatable with both Android 4.4+ and iOS 9.3+, this luxurious smartwatch features a time-only mode, with all smart functions turned off and resulting in a battery life of up-to one week. Fully personalizable, the Summit 2 allows you to choose around 1,000 options, including personalised backgrounds, hands and programmable pushers. With features including voice assistant, mobile payment, the Timeshifter app designed to automatically pick-up on your current time zone, and a live Running Coach app, all of which can be activated whilst always keeping the sleek face visible. Finished with a smart blue nylon strap. This watch features scratch-resistant sapphire glass, and is water resistant up to 50 metres. Sophisticated accessories born of traditional craftsmanship handed down from generation to generation.